Department of Wildlife Conservation staff work with landowners and land managers to implement a habitat enhancement program. An active habitat enhancement program is needed to mitigate the impacts of human development on wildlife and respond to a growing desire to observe and harvest wildlife. This is particularly true near populated, road accessible areas of Alaska. Prescribed burns are fires intentionally started under specific conditions to simulate wildfires. 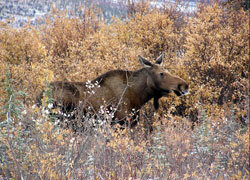 Prescribed burns are used as a management tool to enhance wildlife habitat. Often prescribed burns are also designed to break up large expanses of black spruce forest (reduced risk of widespread crown fire) or reduce the amount of fuel built up on the forest floor (reduced potential for severe fires), particularly near communities. 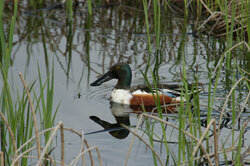 Over 7 million waterfowl utilize Alaska’s coastal tundra and interior boreal forest habitats during the summer months. For the most part, waterfowl habitat in Alaska remains relatively pristine, but increased urbanization, development activities and global warming threatens wetland habitat at the local and regional level. As habitat losses increase throughout North America, Alaska’s value in maintaining healthy populations of waterfowl has increased. Many areas important for waterfowl migration, breeding and staging have been protected within state and federal wildlife refuges. Additionally, the department partners with other government agencies and non-profit organizations to ensure continued quantity and quality of habitat. For more information see: Waterfowl Habitat Enhancement Projects.